Elizabeth Berkley and Greg Lauren Play At The Park With Baby Sky! 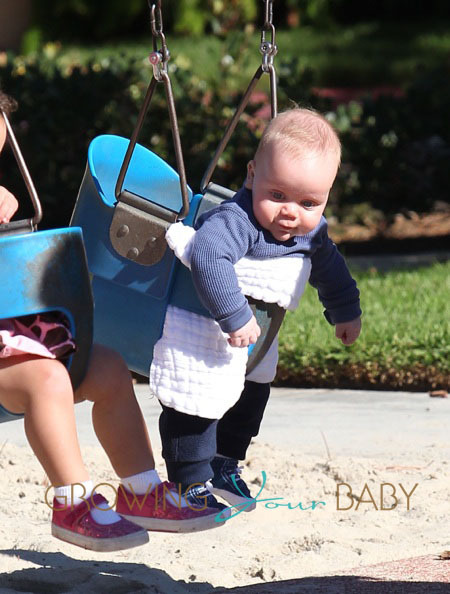 Home » Elizabeth Berkley and Greg Lauren Play At The Park With Baby Sky! New parents Elizabeth Berkley and Greg Lauren were spotted taking their son Sky Cole to Cold Water Canyon Park in Beverly Hills on Sunday afternoon. The couple, who was accompanied by a nanny, sat and watched as the almost 4-month-old moved back and forth in a swing. It was likely Sky’s first time to the park as Elizabeth and Greg watched him intently, looking for his reaction to the new experience. There were, however, no tears so hopefully we will see this cute family back at the park soon! Jillian Michaels and Heidi Rhoades Visit The Farmer’s Market With Their Kids!